Also known as Sharpless-86 (Sh2-86), NGC 6820 is an emission nebula and star forming region located about 6,000 light years from us in the constellation of Vulpecula. 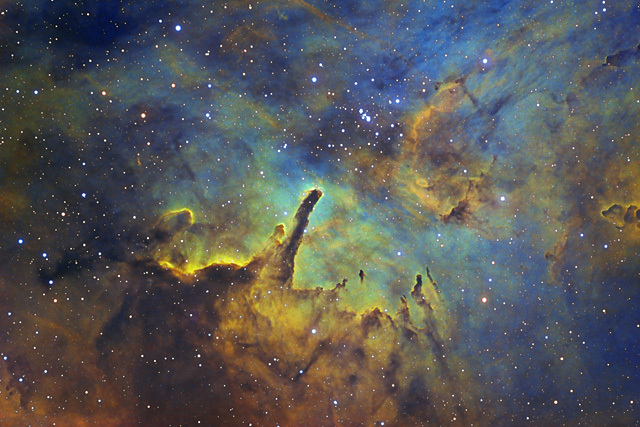 Shown in the upper right of the image is the open star cluster NGC 6823, a collection of newly formed stars originating from the emission nebula. Most of the stars in this cluster are on the order of 2 to 5 million years old. Contained within NGC 6820 are a number of pillars, similar to those found in the Eagle Nebula's Pillars of Creation. These pillars are formed when the radiation from newly formed stars pushes on the nebula's gas and dust. Also shown in this image to the right of the main pillar are numerous Bok globules. These globules will eventually collapse to form new protostars. In this image, North is to the left. This image is cropped to 95% of the original full frame. SQM Reading Bortle 4 on all 11 nights, typically 21.40 to 21.60. Some narrowband data captured with Moon up. Software Used Sequence Generator Pro for image capture, Astro Pixel Processor 1.049 for calibration, pedestal addition, normalization, integration, and initial DDP stretching. Images Plus for star size reduction, edge masking, feature mask, and noise reduction. Photoshop CS5 used for levels and curves, saturation adjustments, selective color, match color, high pass filter, narrowband colorizing and stack blending. Gradient Xterminator for gradient removal. Carboni Tools for additional noise reduction and smoothing. Registar 64 for stack alignment. Focus Magic for focus restoration. PlateSolve 2 for plate solving. Notes This image is the first astrophoto that I've completed with my new telescope - the ES152 6" f/8 refractor. Although the scope still needs some tweaking to it's collimation, it's producing some pretty good images. I struggled with processing this image, as I tried a number of new techniques - some of them successful, some of them not so much. Overall, I'm very happy with how the color palette came out, and I like the details I was able to show. However, I white clipped more stars than necessary, and had to fight some other issues with my stars. Nonetheless, I'm overall pleased with this image, and I think I learned a few things that will help me down the road.